I teach a college course on the Science of Nutrition. But, if you’re only focus is food, you’ll be a slave to the scale for the rest of your life. This is the only eating plan that has helped me lose weight, and I have tried many fad diets, convinced they would help. It is also a plan I can stick to for the rest of my life. A million thanks, Dr. Becky!! ~Julia T.
“I appreciate the step by step layout and the information on how the body works with food. Also the way our body’s react to other things and the fact that she addresses emotional eating better than any other plan out there.” -Erika V.
“This program has helped us to understand so much. We both feel better and no longer doubt that we could meet our goals.” –Marilyn Z. “I wish everybody who struggles with weight could see this because it is so life changing.” -Mary Jane F.
“I lost 50 pounds and kept it off for a year now. This has become part of my lifestyle now, and I really don’t have to think about it”. -Chris H.
“The only thing I find hard, but I’m getting more accustomed is the volume of food, it’s more than I usually eat. But it’s obviously working as I never used to sleep and I feel so much better.” -Tina D.
“I’m so happy with my progress but more importantly that I feel so much better about myself and have a goal in mind. Thanks for all you’ve done for me.” -Laurie H.
Commitment is a funny thing. It can be very strong at the beginning of your goal and then wane as the weeks go on. With this week’s exercise, you weed out any hesitation about reaching your goal as you learn the simple strategy to keeping your commitment strong. 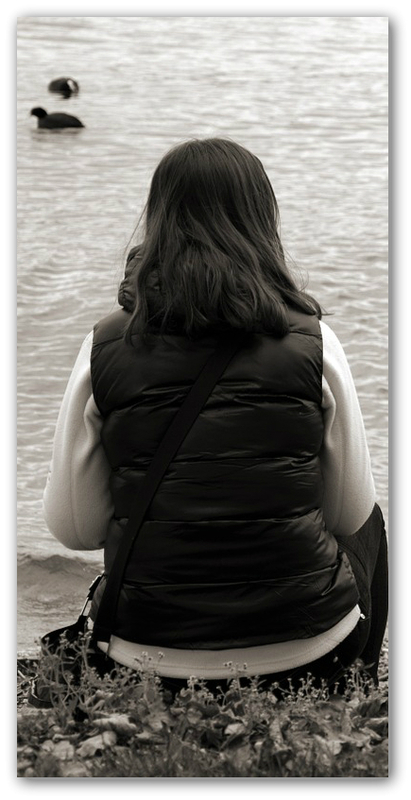 “The coaching modules hold many answers to any questions a newbie may have. The systematic and well-thought-through organization of the coaching program allows me to absorb information at my own rate and on my own schedule, and I can keep learning.” ~Barbara E.
One-Time Fee. You’ll pay once and enjoy the benefits of the coaching program for years to come. There are no recurring costs when you join the 0,1,2,3+ Weight Loss Coaching Program. You’ll be able to go back through the materials as often as you want. Ready-to-Follow Meal Plans. When you want to change your weight, you need that information organized into a usable form. You need to know what to eat, which is why the meal plans are such an enormous value. The 60-20-20 Meal Plan Series was added to accelerate results in even the most weight-resistant bodies! Going Keto Section. New for 2018! 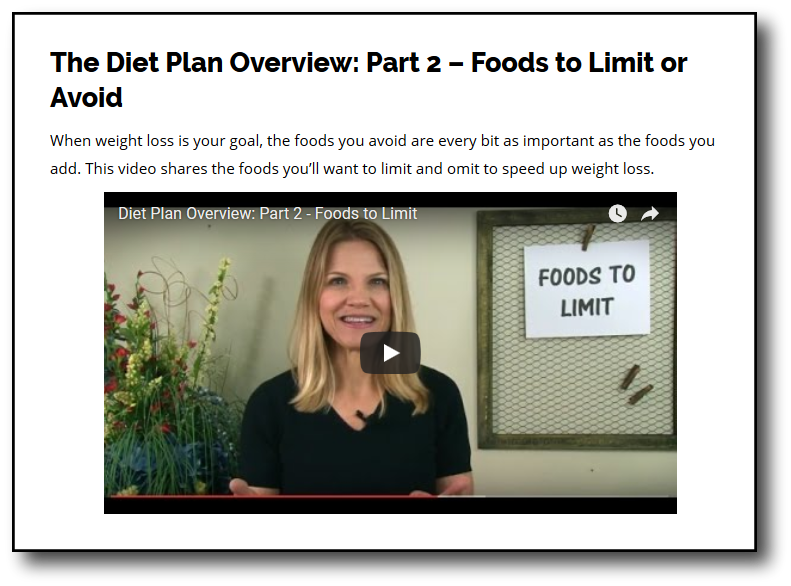 If you want to follow a ketogenic diet, you’ll be able to do so with ease thanks to the Keto Instructional Videos and full Keto Food Plan that makes planning your meals a snap. Member’s Forum. Support is an important part of your success, and with the newly added coaching forum, you’ll have the support you need to succeed. With the forum you can ask questions, share ideas, and meet others on your same journey. Ask Dr. Becky Anything Button. Have a question about what to eat? Just need a little encouragement? Then hit this button for my personal email address. “This program is very well put together. I am very happy with all of the resources provided.” ~JoAnn S.
When you join the coaching program, you get both a low-carb diet plan and a ketogenic diet plan. 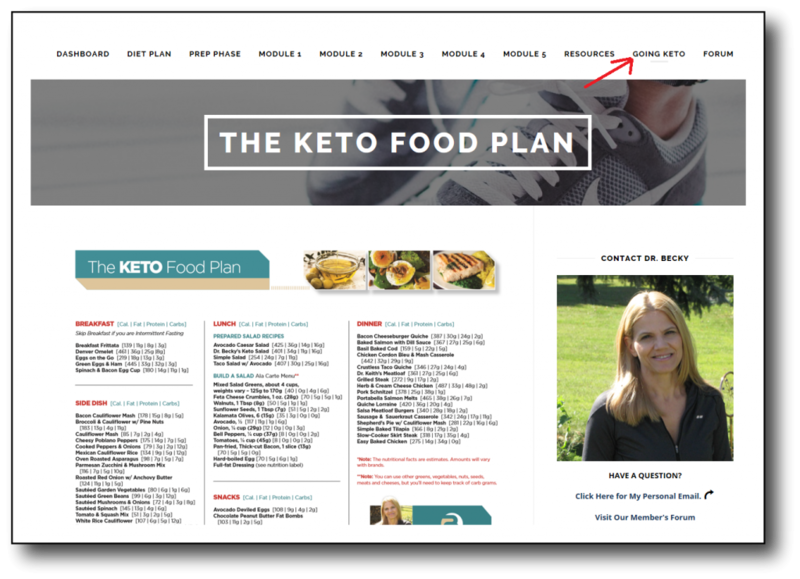 In the “Going Keto” section of our membership site, you’ll be taught the differences between a low-carb diet and a keto diet so that you can make an informed choice. With both diets fully developed for you, you can’t go wrong! “Having started with Dr. Becky’s method precisely on the 7th of August 2015 (and today is the 22nd of October 2015), we’re talking about marvelous results in just 75 days or 2.5 months or almost 11 weeks)! Just as I began, I tipped (or, more accurately, ‘strained’) the scales at a whopping 325.6 lbs (or 148 kgs or 23.30 stn). I now weigh a much more reasonable 297 lbs (or 135 kg or 21.25 stn). It may not sound like a lot, but it is a total weight loss of 28.6 lbs in a mere 75 days (which averages out at 2.67 lbs per week or 1.21 kg per week). Put another way, this represents a drop in my BMI reading from 41.4 to 37.8, a difference of 3.6 points)!” – Mahmoud M.
“Anybody reading this comment is or has been in the same place I have been- Sick and tired of being overweight– I have been labeled Obese for the last time ! In my search for a simple reasonable weight loss program I stumbled across Dr Becky– I kept looking at the program for a couple of months and decided to take the plunge and am very happy I did- Though I have only been active in the program a couple of weeks the weight has started coming off and I am feeling unbelievably better, eating well and sleeping very well– Actually better than I have slept in years ! I am on the way to losing 60 pounds and feel this is the correct program for me ! 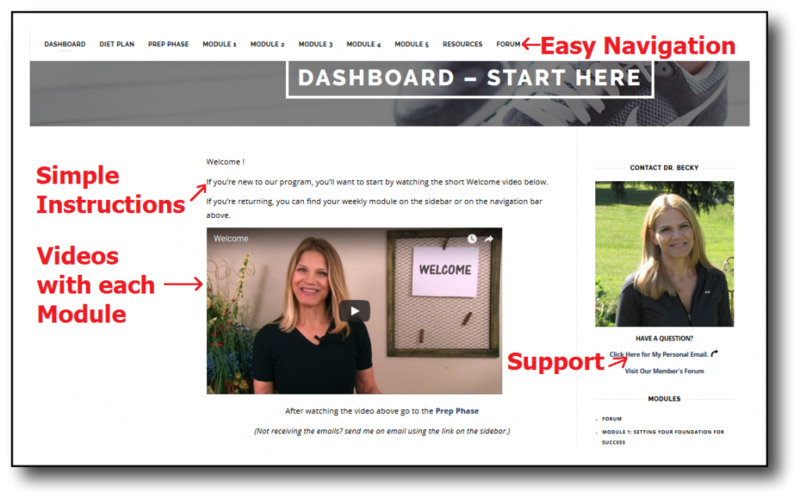 The instruction is simple, videos brief and support great ! Come lose with me ! !” Andrew S.
Here it is: the cost for access to The 0,1,2,3+ Weight Loss Coaching Program is only $97.00. “It’s good to be able to know I can eat all types of food, and just make better choices. I have been able to continue to eat out with friends while still losing weight.” -Cheryl K.
“I enthusiastically recommend Dr. Becky’s coaching program. While I am sure the program is beneficial to many people, I can testify to its effectiveness for a person who has ten, twenty, or thirty pounds to lose, and who is already active and healthy. For such a person, the difference between losing and gaining may be quite small, and using Dr. Becky’s precise and flexible approach ensures success. 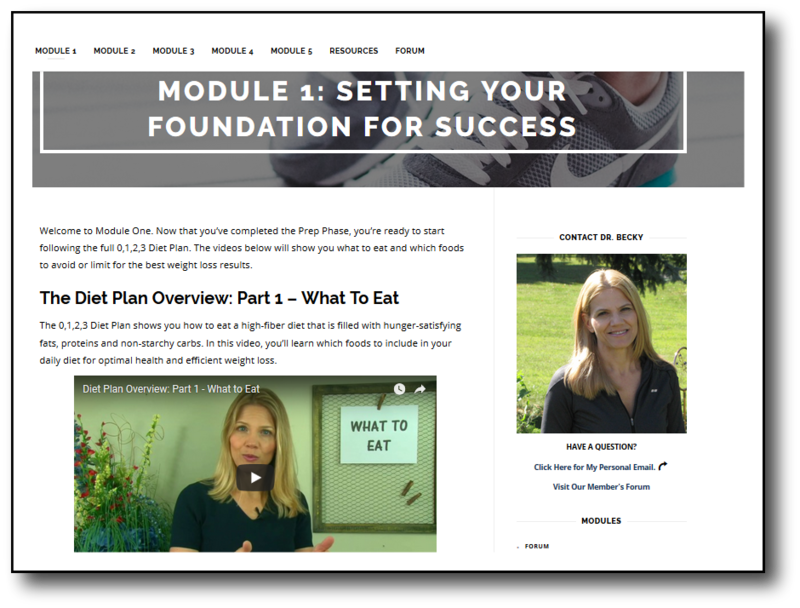 She emphasizes nutrition, ease, and enjoyment, and the videos communicate principles that contribute to increased energy and endurance. I only wish I had discovered this program several years ago. It can be used by the cook and the non-cook with equal success, and is an excellent value. The program includes meal plans and grocery lists and does a lot of work for you! Thanks!” Barbara E.